As Business Relationship Managers we focus on driving business value, building strategic partnerships, and evolving enterprise culture. A large part of success in our role is based on the credibility and strength of the relationships we build by establishing trust. To earn this trust, we set high standards for ourselves and our fellow practitioners according to our core values. This Code of Ethics document describes how we conduct ourselves and the ideals we aspire to hold ourselves and our fellow practitioners accountable. We uphold the BRM Institute Code of Ethics and hold others accountable to it. We conduct ourselves in accordance with the BRM Institute Code of Ethics in all interactions, including training and mentoring others. We guard confidential/propriety information or privileges that have been entrusted to our care. We promptly bring to the attention of the BRM Institute Ethics Review Committee, any information he or she may have concerning any violations of this Code of Ethics. We only file complaints of ethics violations when substantiated by facts. We uphold the rules, regulations, laws, and policies that govern our industry and extend them into our professional and volunteer activities. As practitioners and representatives of the BRM profession, we do not participate in or condone illegal behavior. We build respect and credibility for the BRM profession by engaging in activities that add value to the organizations we serve and the communities in which we work. We encourage professional and social responsibility. We accept professional responsibility for our individual decisions and actions. We encourage, through example, the highest professional standards among all those with whom we work and volunteer. We promote decisions that support the best long-term interests of our business partners, their customers, our organization, and the communities in which we work. We give back to the BRM community through training and mentoring others. We recognize and respect the contributions of others and only claim ownership of our own work. We are responsible for maintaining BRM competency by keeping our skills and knowledge current. BRM professionals are expected to continuously develop their professional skills by participating in continuing education courses, reading pertinent literature, and attending professional meetings and seminars. Giving back to the BRM community by sharing knowledge with others aids in keeping skills sharp while also contributing to the BRM profession. BRM professionals who hold the Certified Business Relationship Manager (CBRM) designation are required to complete a minimum of 40 Continuing Professional Development (CPD) credits every year (120 CPDs total over the 3-year certification period). The CBRM program is one part of the Business Relationship Management Knowledge Path to Success, which guides BRM professionals through the BRM role and capability to succeed. As BRM’s, your reputation and integrity are critical to your continued success as one’s reputation is impacted every day by your actions on and off the job. It is our duty to build trust with our partners by revealing all information needed for responsible decision making. To represent one’s skills, knowledge, and experiences with honesty and integrity enabling partners, employers, and other business associates to make fully informed business decisions. Be honest and accurate in all communications, both written and verbal. 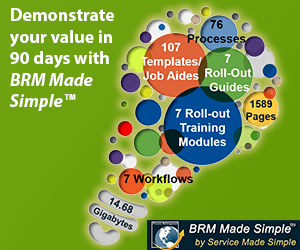 Ensure your everyday actions are consistent with the BRM Code of Ethics. Never engage in any misconduct that could jeopardize the company’s brand or our client or vendor relationships. Avoid any appearance of impropriety. To disclose all existing and potential business relationships that may, or may be perceived to, influence or affect an individual or organizational business decision or commitment. To not knowingly misrepresent or mislead when sharing information about other professionals or organizations. Disclose all material facts known to them that, if not disclosed, may distort the decision making of their clients, prospects, employers, employees, or others. To properly cite and credit the source of all information and ideas used, presented, and shared with others. As BRM professionals, we must uphold a high level of trust and professionalism with our partners. It is our duty to protect the interest of our partners, as well as our professional integrity and should not engage in activities that create actual, apparent, or potential conflicts of interest. To avoid activities that are in conflict with, or have a perceived conflict with, any of the provisions of this Code of Ethical and Professional Standards or with one’s responsibilities and duties as an employee of their organization. Adhere to and advocate the use of published policies on conflicts of interest within your organization. Responsibility to ensure a conflict of interest does not compromise the legitimate interests of a client or customer, or influence/interfere with professional judgments. Prioritize your obligations to identify conflicts of interest or the appearance thereof; when conflicts arise, disclose them to relevant partners. We will practice good corporate citizenship by serving the public, our organization, and the communities in which we live and work. We will uphold the BRM Institute Code of Ethics while serving the public, our organization, and the communities in which we live and work. We will provide professional and community leadership. We will serve the public by acting as responsible advocates for the values represented by the BRM Institute. Accountability is generally the state of being answerable, responsible, liable to or for actions taken; being able to clarify or justify actions. It also implies that some legal rule(s) exists under which a theory or claim can be made; and that the organization has a duty to explain and account for its actions. Fairness is a social norm marked by impartiality and honesty, typically referring to an attitude or environment that is free from self-interest, prejudice or favoritism. Within business transactions, it implies a conformation to established rules or denotes adherence to generally accepted systems of merit or importance. Individually it refers to a person who not only makes decisions free of discrimination or dishonesty, but also one who is open to legitimate evaluation, ridicule, attack, or legal pursuit. As BRM’s we agree to be accountable for the commitments we undertake. When we make errors or omissions, we take ownership and make corrections promptly. When we discover inaccuracies or oversights caused by others, we communicate with them as appropriate as soon as they are discovered. We accept accountability for our errors or omissions and any resulting consequences. We protect proprietary or confidential information that has been entrusted to us. We inform ourselves and uphold the policies, rules, regulations, and laws that govern our work, professional, and volunteer activities. In the spirit of fairness, we report the unethical or illegal conduct to appropriate management and, if necessary, to those affected by the conduct.